Have you ever thought to yourself, "people would really like my blog if they just knew about it"? 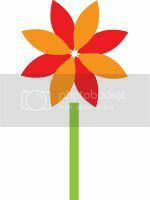 A StumbleUpon ad campaign can help introduce your blog or site to the world for as little as $25. I just completed a campaign myself. BlogCoach is a very new blog. It generally gets about a hundred readers a day. Before the StumbleUpon campaign, I had a subscriber base in the mid 50s. I believe that this blog can help a lot of bloggers, and I want to spread the word about it as quickly as I can. If you're not familiar with StumbleUpon, take a look before you invest in a campaign. It's a social bookmarking / website discovery site that's pretty addictive. Basically, you create an account and select the kinds of sites you're interested in being shown. Then you "Stumble" by clicking a button and are shown a website within your interest categories that people think is cool. You make StumbleUpon even better at delivering sites you'll like by giving "thumbs up" and "thumbs down" to the sites you see. I've discovered and bookmarked dozens of design sites and frugal living sites through StumbleUpon. You can (and should!) submit your own site to StumbleUpon, but unlike an ad campaign, you have no control over how many times it gets shown to other users. A StumbleUpon ad campaign allows your site to be shown to users a guaranteed number of times per day at a cost of a nickle per showing. A $25 investment got me 500 viewings over a five-day period (100 a day). You also get to find out how viewers liked your site by taking a look at the percentage of thumbs up vots to thumbs down votes. Setting up a campaign at StumbleUpon is pretty easy. 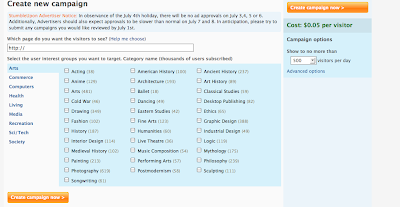 First, tell StumbleUpon which categories your site falls into. Then click "advanced options" and tell them whom you want your site shown to (age, location gender, etc.). Finally, fund your account with $25 and set your daily budget (how many times per day your site will be shown). The folks at StumbleUpon will approve your campain and email you within 24 hours. That's it. You can pause or edit your campaign at any time. How did the StumbleUpon campaign work out for BlogCoach? My subscriber base has gone up 17%. I'm pretty happy with that number. I'll have to take a look at my stats this week to see whether the campaign had any lasting effect on my unique visitor count. One thing I do know is that around 500 potential readers took at least a quick look at BlogCoach.org. That's a MUCH higher rate of return than I get with other types of advertising. 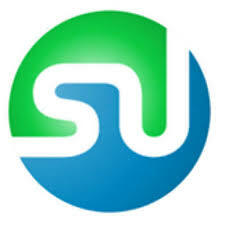 Readers: Have you tried advertising your site with StumbleUpon? If you do, let me know how it goes! note: I'm not affiliated with StumbleUpon in any way.